Originally built as 56045 at BREL’s Doncaster Works in spring 1978 , 56045 was the fifteenth dedicated diesel electric freight locomotive to be built in the UK for BR, entering revenue earning service on the national network on 1st June 1978. 56045 was withdrawn from EWS service in June 1999 at Immingham TMD as the locomotive was overdue main works overhaul which couldn’t be justified given the short term life expectancy of the class. After withdrawal from EWS service, 56045 and 56124 were purchased in 2004 by Edward Stevenson and subsequently sold in 2005 to Fastline Ltd, a subsidiary of the railway maintenance contractor Jarvis. 56045 was overhauled for Fastline by Brush Traction Ltd at Loughborough in late 2005 and was officially renumbered as 56301 in March 2006. 56301 was then used alongside 56302 (ex-56124), and RVEL owned 56303 (ex-56125) on the Fastline container trains which ran between Doncaster, Grain, Birch Coppice and Trafford Park. 56301 was the loco involved when a couple of containers were blown from train 4E90 00:07 Grain – Doncaster whilst passing Cheddington in high winds on 1/3/2008. Interestingly the Class 56 Group (C56G) has had two opportunities to purchase locomotive 56124 . The first was in early 2004 when 56124 was offered to the group by HNRC, and stored at Knottingley Depot. The second was when Class 56 C56G members visited Hitchin in late 2010 to view 56301 & 56302. Both locomotives were in similar condition but 56301 accumulated less hours in service and had thicker tyres so we opted for 56301. Unlike the C56G, Edward Stevenson has actually purchased 56124 twice and sold it twice ,once to Fastline and the second to Colas. To fund the purchase of 56301 the Group appealed for funds but in the event group had to unfortunately sell its first locomotive for scrap, namely 56040 ”Oystermouth”. 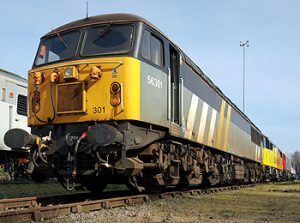 This sad event was made easier to accept , by the fact that the Class 56 Group was swapping a locomotive which required a lot of work needing doing to it, for a locomotive which was only five years out of a full overhaul and was mainline certified. After the purchase 56301 moved from Hitchin to Barrow Hill and after a short spell at Nemesis Burto_nMoved to Washwood Heath where it was assessed for a return to mainline operation by both Boden Rail Engineering and DCR . DCR were given the work and within weeks 56301 was heading out on her first mainline working under C56G ownership. The trip took place in 3rd December 2012 was supposed to see 56301 taking coaching stock to the Oakhampton via Eastleigh for the lines Christmas trains. While passing through the Didcot area 56301 was summoned to rescue 56312 which had failed at Claydon on the 6Z91 10:55 Calvert-Willesden duty. This began a lengthy period of use by DCR which saw long periods of daily use on the Calvert-Willesden trips used to move spoil from the crossrail project. The loco then saw use on the nightly railvac operations based out of Totton Yard near Eastleigh. With workings to move coal between Butterwell, Kellingley and Thoresby the loco certainly saw plently of use. However towards the end of 2015 56301 developed wheel flats and subsequent wheel bearing failure which meant a period under repair at UKRL Leicester. During the period out of traffic the market for spot hire locos seemes to have taken a downturn and 56301 has only seen infrequent use since then. Trips have included moving HST trailer coaches between Laira and Kilmarnock and movement of London Midland class 323 units between Soho and Tyesley for tyre turning. July 2016 – 56301 is currently undergoing repairs at UKRL Leicester following a failure on the Kilmarnock -Laira ECS train on 1st February 2016. The locomotive failed with high water temperature and a thorough examination undertaken to identify the root cause and any other work required.